In the sixth book of the “entertaining, fast-paced” (Booklist) Wine Country Mystery series, Lucie Montgomery tracks down a secret society to uncover mysterious. Among the world-class vineyards of the Napa Valley, “Virginia’s favorite vintner-detective” (Library Journal) and her winemaker ex-beau investigate the role of a secret society in two mysterious deaths— and whether there is hope for their rocky romance. When Lucie Montgomery finds the dead body of a prominent wine merchant hanging from a beam in his art studio, she is unwittingly dragged into his murky past and its dangerous implications for a family friend. The puzzle sends Lucie to California wine country where she teams up with former lover Quinn Santori. Soon they are embroiled in a deadly cat-and-mouse game to discover whether a killer is seeking vengeance for a longago cover-up. As Lucie and Quinn examine clues from the past, they must also decide whether they have a future together. 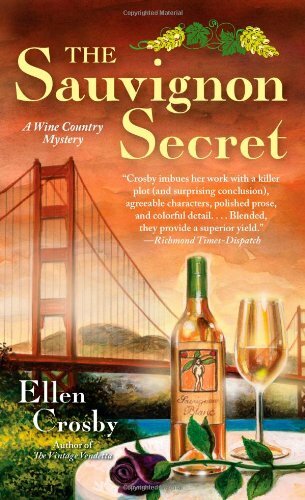 Ellen Crosby blends an intriguing mystery with an absorbing plot, vivid characters, and a richly evoked setting in a charming tale that should be savored like a glass of fine wine. Ellen Crosby is a former freelance reporter for The Washington Post and was the Moscow correspondent for ABC Radio News. She is the author of The Viognier Vendetta, The Riesling Retribution, The Bordeaux Betrayal, The Chardonnay Charade, and The Merlot Murders, as well as Moscow Nights, a stand-alone novel published in London. Crosby lives in Virginia with her family.